Keeping your office clean can seem like a bit of a chore. It may seem impossible to work around cleaning your office correctly and doing it greenly, however, we have provided you with 8 tips to help you achieve a clean and green office. Avoid air fresheners and fabric protection sprays as they contain chemicals that have been linked to causing reproductive problems. Try to avoid choosing carpet for your flooring when opening a new facility. If you do have carpet, stay away from carpet cleaners and stain-resistant treatments that expose your office to chemicals – opt for a steam cleaner instead. Be cautious of old furniture, as it could be a fire retardant that breaks down into dangerous metabolites linked to cancer. 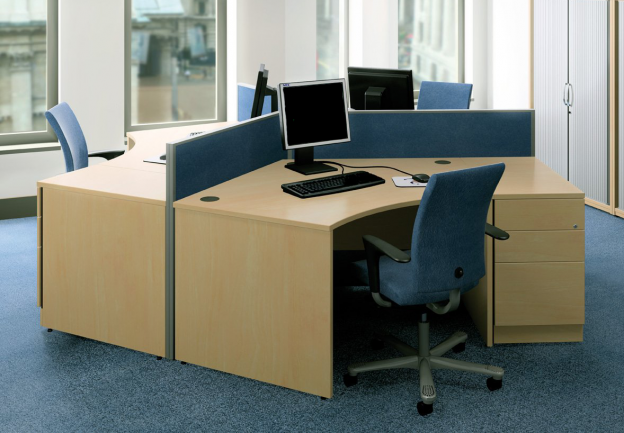 Therefore it is always advisable not to leave it too late when updating your office furniture. Perhaps it would be a sensible idea to assess your office furniture solutions every other year so you can keep up with modern trends. For any DIY project, there are many standard household items that you can use to clean surfaces and handle tough odours, including lemon, vinegar, baking powder and more. Make sure your internal and/or external cleaning team has the resources to check the air quality in your indoor space, such as checking HVAC systems. Establish a cleaning policy with all of your employees in the office by educating them about the damaging effects of cleaning products etc. Hire an office cleaning company that works safely and offers facility maintenance. A professional cleaning company will work with you to understand your specific needs.